We’ve been getting together regularly with a group of friends for about 4 years now, meeting at someone’s house to share food and wine. Each couple is responsible for a course, and a bottle of wine to go with that course, with the host couple responsible for the theme for the evening and the main course. The most recent of these had a theme of comfort food made better with wine in the dish. For the main course Lori made chicken cacciatore, with a healthy dose of red wine added to the sauce. This was a dish her mother made when she was growing up. While the recipe is basically Italian in derivation, I’m not sure that you would find it served with mashed potatoes, as it was in Lori’s house. But the potatoes work well to soak up the sauce! 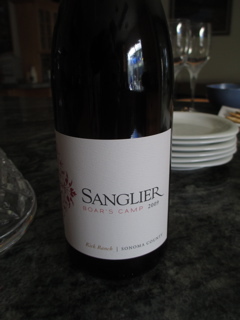 We served this with a bottle of 2009 Sanglier Cellars, Kick Ranch Vineyard, Boar’s Camp Cuvee, which is a blend of 65% Syrah, 21% Grenache and 14% Cinsault. Great together. Just to be complete, one couple brought a 2013 Tamber Bey Vineyards Napa Valley Sauvignon Blance to go with the starter course, while the other couple brought a 2009 Jericho Canyon Vineyard Napa Valley Cabernet Sauvignon. The Cab was supposed to be a wine for dessert, but they decided that they wanted to share this nice bottle with us, and so we had this one also with dinner. This entry was posted in food and wine, Kick Ranch, Sanglier Cellars and tagged comfort food, food and wine, Jericho Canyon Vineyard, Sanglier Cellars, Syrah blend, Tamber Bey Vineyards on June 22, 2014 by vvblogman.